Yahya says Mengalum illegal structures to be demolished | Daily Express Online, Sabah, Malaysia. 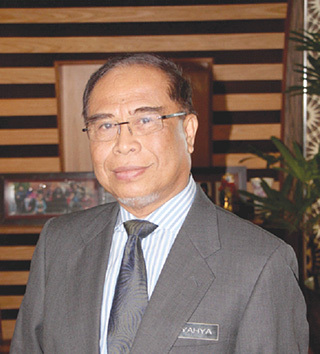 Kota Kinabalu: Illegal structures in Pulau Mengalum will be immediately demolished, said Deputy Chief Minister Datuk Seri Yahya Hussin (pic).Yahya, who is also State Agriculture and Food Industry Minister, said he noted there were a few illegal structures in Pulau Mengalum when he visited the island last year. "We instructed them to be demolished, but I was made to understand that the demolition has yet to be conducted. "So now I have instructed my (veterinary) officers to demolish them with the cooperation of the Land and Survey Department and other authorities. "We are not able to dismantle them on our own as we do not have the needed manpower," he said after attending Parti Gerakan Rakyat Malaysia's (Gerakan) Chinese New Year celebration, here, Saturday. According to him, the island was meant for quarantine purposes and not for tourism. "Tourism operators are not supposed to utilise any illegal structure." Meanwhile, Yahya reminded local fishermen to refrain from using their traditional jetties for purposes other than for unloading their catch and to dock their fishing boats. He said such jetties should be monitored as many local fishermen in the State constructed their own jetties. "The jetties are meant to facilitate them in unloading their catch and it is not supposed to be used by tourists. "If tourists utilise such jetties, then appropriate action should be taken," he said. Yahya was commenting on the recent catamaran boat sinking which claimed the lives of three tourists from China with six still unaccounted for. In the Jan. 28 mishap, the ill-fated catamaran meant for 12 was used to carry 31 people, including 28 tourists from China. It headed for Pulau Mengalum from an undesignated jetty in Kampung Tanjung Aru, here probably because it was not allowed to use the proper jetty at Jesselton Point over safety issues. "The tragedy served as a reminder to everyone so that such incident will not recur." He also said local authorities should intensify their effort in monitoring and supervising such jetties. City Hall has started dismantling the wooden fishermen's jetty in Kg Tanjung Aru and Mayor Datuk Yeo Boon Hai said they had stationed enforcement personnel at both jetties to monitor them. It was also reported that tour operator Borneo Proboscis Destination has government backing to ferry tourists out to the islands from the jetty. Borneo Proboscis Destination manager Tang Yeu was reported as saying that the company had an exclusive arrangement with the Tanjung Aru Fishermen's Association, the caretaker of the village's fishermen jetty, to run his business there. Supporting Tang's claim, Kampung Tanjung Aru Village Security and Development Committee chairman Matsah Sahat also said that they had permission letters from two ministers to pick up and drop tourists from the jetty. Matsah was reported as saying that they had produced a permission letter which was endorsed by Yahya and forwarded it to the Tourism, Culture and Environment Minister. He claimed the latter even wrote a "no objection" letter to them thereafter. The letters were issued in 2015.